Birding Corvo 2009: Savannah Sparrow! Started in the village today to look for the Grackle, but no sign of it. Also did some seawatching but found nothing but Cory's. Kicked some fields with Pierre and then went back to the guesthouse and had a break after seeing a Yellow-billed Cuckoo. In the village Eric heard something on the radio that sounded like someone had found a Sparrow, a probable Savannah Sparrow. We couldn't find out anything more about the bird so we decided to head up towards the valleys and try to radio the others. 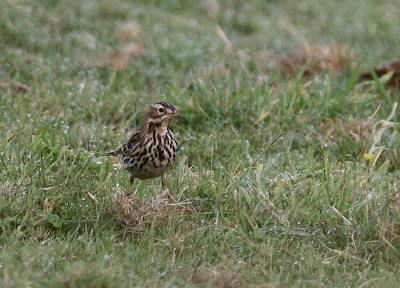 After a sweaty walk we managed to get through to Daniele who had seen a Savannah Sparrow, just like we suspected, up by the reservoir. Everyone went up there pretty soon but the conditions were horrible with very strong wind, fog and a little bit of rain just to mess up all optics. 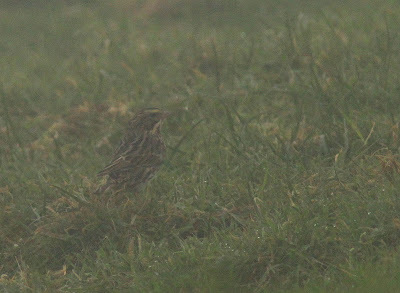 Thanks to this noone saw the bird :( We did hear and see a Red-throated pipit though, the fifht for the Azores. 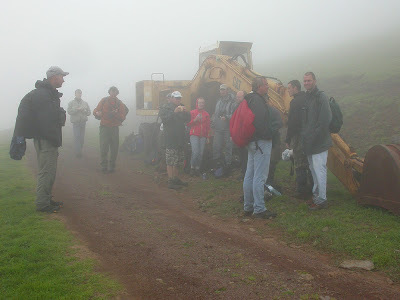 A wet and cold group of birders sheltering behing a "Cat" for lunch. Went down to the village to say bye to Simon, Eric, Pierre and the others before I went up to the mountain again to gie the Sparrow another try. When I got up there the fog disappeared and I got about an hour of clear weather which produced two Red-throated Pipits and the two Dotterels. After a while I heard a car coming and out jumped about eight other birders who had decided to give the Sparrow another go. It didn't take long before David had relocated the bird, but then the fog started to come in again and only Hannu got to see the bird. NOT good! Anyway, after another 15 minutes or so of nervous waiting we all had gotten good views of the bird in the fog. Jadang! On the way back we bumped into Staffan Rodebrand and Rich Bonser who were looking for the Northern Parula at the power plant. The bird gave som absolutely excellent views at dusk. Definately the best looking bird out here so far this autumn! 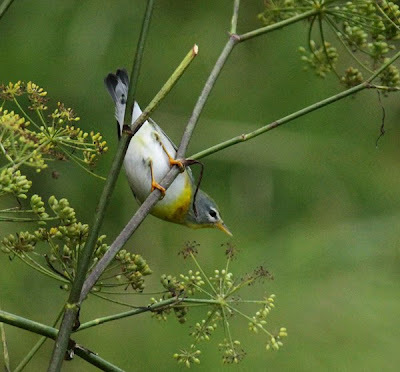 Northern Parula again, what a bird! Between 14th September and 16th November I'm birding the island of Corvo (Azores). Here you can read daily updates about the happenings out here during my stay. Enjoy! Darryl and his Canadian friend! A 1st for Corvo and more Yanks!